Whitefriars Street office space has been fitted out to an exceptional standard and has stylish furniture within. 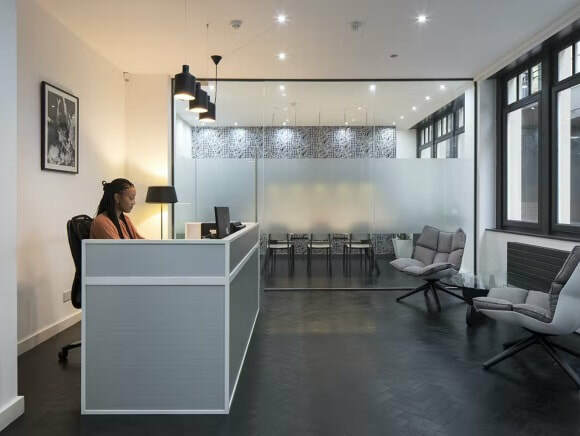 Spread over a number of floors, these serviced offices for rent are pre-cabled with Cat 5e cabling and has multiple IT points for each user or person. Furniture comes free to all offices and telephone handsets are provided. With a meeting room as well as a boardroom on-site, hourly hire is available with also half/full days too. There is also access to Wi-Fi within the meeting facilities. Totally unbranded, this Business Centre has a selection of features including bicycle storage and break areas that can be communally used. Twenty-four house access to the building is allowed and security systems are in place. At the entrance of the property, a stunning reception can be found that has attentive staff to help with any needs.